New York (September 3, 2014) – Proexport recently promoted the nation of Colombia brand to businesses in the US with a day-long series of events at the Metropolitan Pavilion in New York where WorldStage provided extensive audio, video and lighting support, including an unusual multi-projector array to accommodate the unique requirements of the Gallery’s reception visual display. A government agency and part of the executive branch of the government of Colombia, Proexport is in charge of promoting Colombian exports, international tourism and foreign investment. The event featured panel discussions in the Metropolitan Suite, a Business Matchmaking Session and a closing cocktail reception, focusing on the campaign, “Colombian IT” in the Gallery. WorldStage was approached by Sístole, a non-traditional marketing and advertising agency, based in Colombia, to handle all the technical elements for the event. “Our client had ambitious plans for the space, taking it well beyond the typical seminar and reception look, which is always a challenge we look forward to.” says WorldStage project manager Frank Mejia. For the space called The Gallery, a beautiful space with white epoxy floors and custom lighting, Sonic Design from Bogota Colombia was called to designed an immersive lighting and video display system with several unique features aimed to overcome the challenges of limited ceiling height and exposed ductwork. 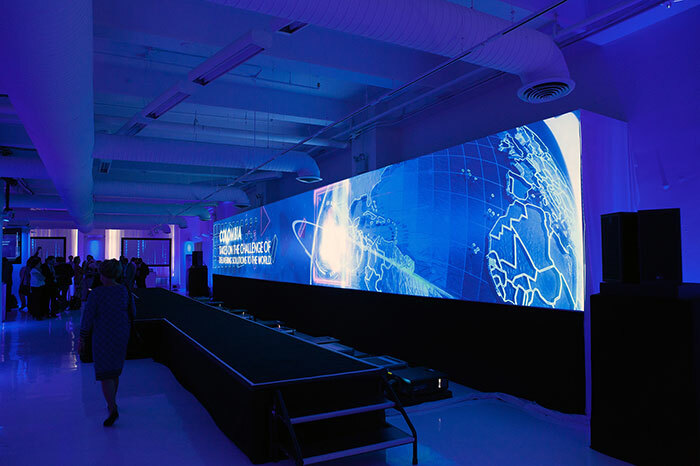 WorldStage also installed four Sharp 90-inch LCD monitors on truss; the client provided a Pandora’s Box media server and its programmer. A Lightware MX32 DVI digital matrix router frame handled signal routing. WorldStage supplemented the Gallery’s ColorBlast TR fixtures with 36 Astera AL7 wireless floor spots, 72 Elation EPAR QA LED PARs and 10 Source 4 ellipsoidals controlled by a grandMA2 light. Audio needs were met with a Yamaha QL5 mixer, 12 Meyer compact loudspeakers and 4 Meyer subwoofers.